← Taking Care of Body Business . . .
My friend Mary Kay sent this to me soon after our last Couple’s Book Group meeting at my house. Mary Kay and her husband traveled the Camino de Santiago on bicycles last fall, through Experience Plus, a bicycle and walking touring company, owned by friends of mine, based right here in my Colorado town, with an Italian office as well. We talked about their recent trip, and my upcoming one on the Camino, and I am grateful that I was on her mind when her poet’s heart created this lovely poem. The Haiku appeared fortuitously, since I’ve been going through some questions, Self-Assessment questions, in John Brierley’s book, A Pilgrim’s Guide to the Camino Frances. The first question is “How do you differentiate pilgrimage from a long-distance walk?” Well, I’ve done a few fairly long-distance walks, some planned, some not. Walking the Bolder Boulder puts one in the 10K category, which by comparison to the Camino, is a spit up the road, nothing more. 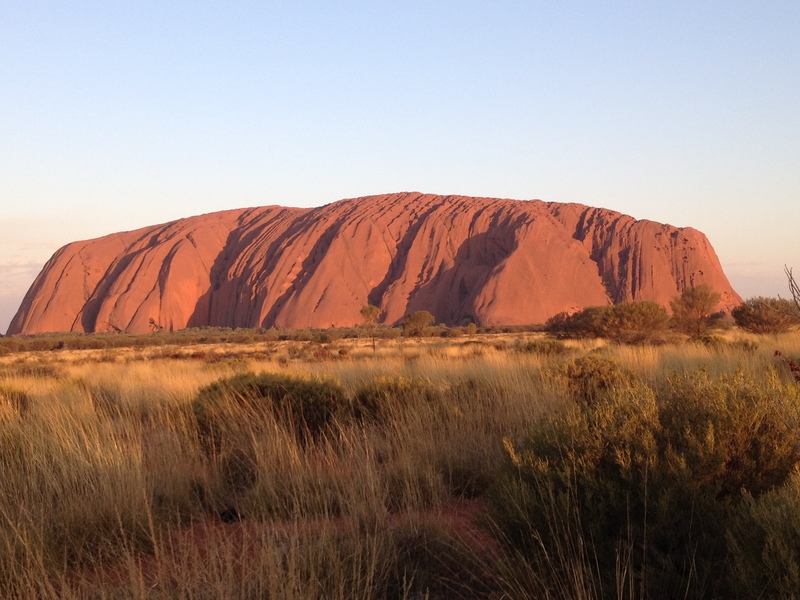 Walking around Uluru, another 10K circuit, is so easy and peaceful, with this magnificent view, or parts of it, at your side, that one doesn’t even think about distances. But again, compared with the 1000K I will walk in the fall, it doesn’t qualify as “long-distance”. Unplanned long walks, like the ones we do in New York City, just start when we walk out the door of our hotel, perhaps in Chelsea, and begin to stroll for awhile, finding ourselves on the Upper West Side for breakfast, across town at Rizolli’s books, and back to the hotel. It might take much of a day, and we stop at a coffee shop, a museum, the American Craftsman store on 7th or 8th Avenue, but we do quite a distance on those strolling adventures. A pilgrimage . . . well, I’m not religious at all. Perhaps a bit of a spiritual atheist, but more the atheist these days than the spiritual part. Still, I have a compelling desire to go inward, not for something specific, but rather for the experience of NOT having an agenda for once in my life. Am I looking for my truth? Well, honestly, no. Might I find it? Perhaps . . . but I’m looking for the opportunity to hear and feel myself muse without the interruption of the phone, an event I have to plan or attend, or the computer’s “Ding” calling me to check the latest e-mail. Solitude, beauty, physical challenge, and possibility . . . an organic journey for myself. I can feel myself taking in mini-doses of this as I walk the Kathy Fromme Trail near my house, or circumnavigate the sacred red rock at Uluru, and sometimes even in the midst of what some people call the chaos of New York City. But 35-45 days, without planned traveling companions, in a country where I can barely say hello (I’m working on that Spanish language! ), pushing myself physically, more than I had ever dreamed . . . that sounds like a good enough definition of “pilgrimage” for me, until I actually experience it. More musings on the Self Assessment questions next time. For now, I think I’ll just let this soak. This entry was posted in Australia walking, Body readiness, Camino de Santiago, Preparation, Spain, What Goes on in the Mind, Why Walk The Camino?, Women Walking and tagged Bolder Boulder, Camino de Santiago, New York City walking, pilgrimage, truth, Uluru, walking. Bookmark the permalink. I read The Art of Pilgrimage before I travelled to Spain. You may want to consider reading it. Speaking Spanish on the Camino is not necessary – most speak English and more peregrinos speak German than Spanish. It will be amazing! Thanks for that recommendation, Julie. As for the Spanish, I never assume I don’t need any of the foreign language spoken in countries I visit. I won’t know much, but I can at least make the effort. And you actually DO know Spanish . . . it always seems easy for those who KNOW the language to comfort those who don’t, and for that I thank you. But I at least want to know some basic Spanish for this trip . . . then I’ll go back to my Italian, which I tend to use when I’m at a loss for a Spanish word anyway. Sometimes it works, but at other times, it can be a disaster . . . like asking for Butter . . . if that Italian word flies out of my mouth (burro), I’ll be presented with a donkey! Thanks so much for commenting on my blog recently! I look forward to being in touch when I return!